Welcome to Part 2 of “Taking Blurred Water Pictures of Creeks”. The first article focused on setting up the shot, including settings and positioning. This article deals with the fun stuff… composing and shooting. 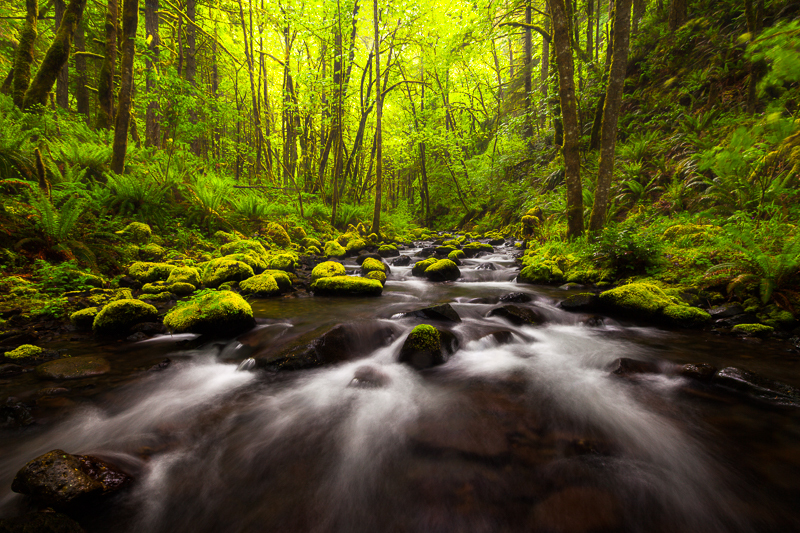 Use leading lines to direct the viewer’s attention – This is an often used compositional technique, but is especially helpful in creek shots. Creeks are full of leading lines, starting with the creek itself. As in the shot below, look for rapids which will form white blurry lines. Also look for rocks to form leading lines. You want the stream, rocks and whatever else to focus the viewer’s attention where you want it. Generally speaking, you will want to avoid straight lines in your composition, particularly if they don’t point to the background or subject. If there are fallen trees in the middle of your composition, you might have to think about a different spot until they get cleared out. Fall colors on Little River off of Middle Prong Trail. Don’t let the rapids run out of the frame – Remember those white blurred lines we just talked about? 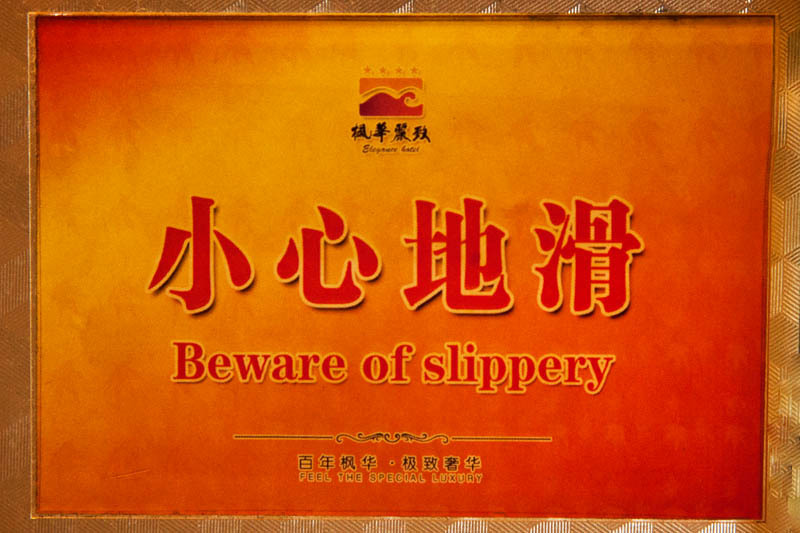 Well, you will typically not want these small rapids running out of your composition. It doesn’t look good. Notice in the image above that the blurred rapids are close to the edge of the image, but don’t actually run out of the frame. Avoid patchy lighting – Don’t go out on a bright sunny afternoon and expect good creek shots. You will want to avoid patchy lighting in your foreground or background, so shoot in cloudy conditions, or else very early or late in the day. This isn’t necessarily a rule… sometimes a bit of sun coming through the trees can really add a nice glowing effect on the scene. It is harsh, patchy light you want to avoid. The shot must be compelling, front to back – When composing, make sure the entire image works together. The foreground and background need to have a connection. Include partially submerged objects – Sometimes a leaf or other objects which have water flowing over them can really add to the picture. Notice the water running over the leaves near the foreground in the image above. Look for natural “frames” within the picture – Curved trees near the top of the frame look cool and help form a natural frame for the image. I’m talking about distant trees, not close-up. In general, I don’t like using leaves in the immediate foreground to frame an image. 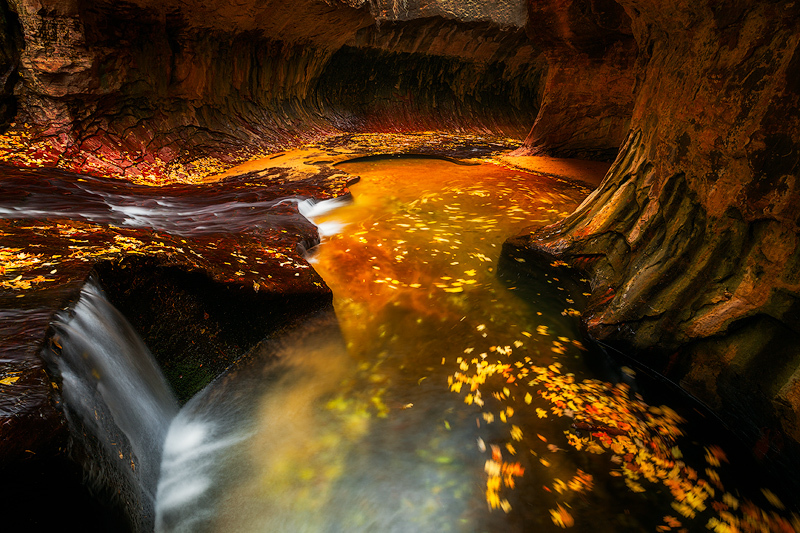 Use Live view – As in most landscape images, using “live view” is helpful in getting good focus on the scene. For creeks, you generally want your scene to be sharp from front to back and avoid blurred objects in the foreground. This is a much bigger topic that is beyond the scope of this blog, however. Use wide angles, but not necessarily the widest setting – Although a lot of people set their wide angles to the widest setting, this doesn’t always work in stream shots. You are trying to balance the emphasis placed on the foreground and background. The widest setting of your wide angle may not give you the right balance. Sometimes two shots are necessary – With long shutter speeds, trees and plants have more time to move due to wind. You may want to take two shots and blend them… one with a fast shutter speed to freeze the blurred plants and a second with a longer shutter speed to blur the water. This is especially true for foreground plants. You can get away with some blurred leaves in the distance, but blurry foreground objects ruin the image. Leaf blurs – If there is a small pool in your composition which has a current (especially a circular current), then toss some leaves in there to get a nice leaf blur. This adds some motion to the images, as in the image below. Bonus tip – Once it gets too bright outside to shoot standard creek shots, consider shooting some reflections in the creek. These can make great abstract pictures, especially if the light is hitting the trees along the creek (which are reflected in the water), but not lighting the creek itself. Posted in Tips and Tricks on November 12, 2013 November 13, 2013 by Ken Koskela. The list of types of water bodies can be overwhelming. In the river category alone, there are creeks, streams, brooks, rivers and a bunch of other names for each of those. I think the reason for this is that, throughout history, there have been a lot of people hanging out at small rivers waiting for the fish to bite who had nothing better to do than to think up additional names for water bodies. Well, I’m fighting against this and limiting my blog title to “creeks”. However, the same principles apply to brooks, streams, small rivers, cricks, forks and tributaries. 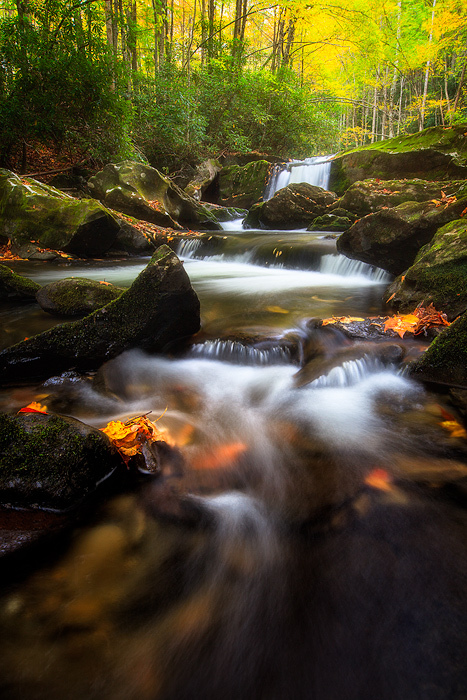 This is a two-part blog on shooting a creek with a blurred water effect, such as in my shot below from a recent trip to the Smoky Mountains. I’m doing this blog in two parts because I prefer to keep these articles fairly short and sweet. Part 1 focuses on everything before you actually compose and shoot. Part 2 will focus on the composition and shot itself. Creek on Middle Prong Trail of Little River during Autumn. Polarizing Filter – Polarizer filters are necessary for shooting streams for two reasons: 1) They reduce the light getting to the sensor, which allows you to shoot longer shutter speeds. Without this reduced light, your shutter speed would be too fast to blur the water during daylight hours; and 2) They reduce or eliminate glare from the water surface. This glare can ruin your picture. I use a circular polarizer and rotate it until the glare disappears or is at its’ minimum. You can also combine the polarizer with a neutral density filter to restrict the light even more, allowing for even slower shutter speeds. Tripod – You will need a tripod due to the slow shutter speeds. Also, flimsy tripods won’t work well if you have your tripod legs in the water while shooting. Wide Angle Lens – I use a wide-angle zoom most of the time. A tilt-shift lens is another option, if you have one. Mode – I recommend manual mode, which will help you pay close attention to both aperture and shutter speed. Shutter Speed – You want shutter speeds in the range of 0.5-5 seconds or more. The longer the exposure, the more blurred the water will be. Aperture – Your composition will likely include foreground and background elements which should be sharp throughout, which means small aperture. I generally use F16 as a starting point when shooting wide angle and have foreground elements fairly close to the lens, which is typically the case in shooting streams. Some of the better compositions require standing in the water – You have to use good judgment about whether or not it is safe to shoot from in the water. 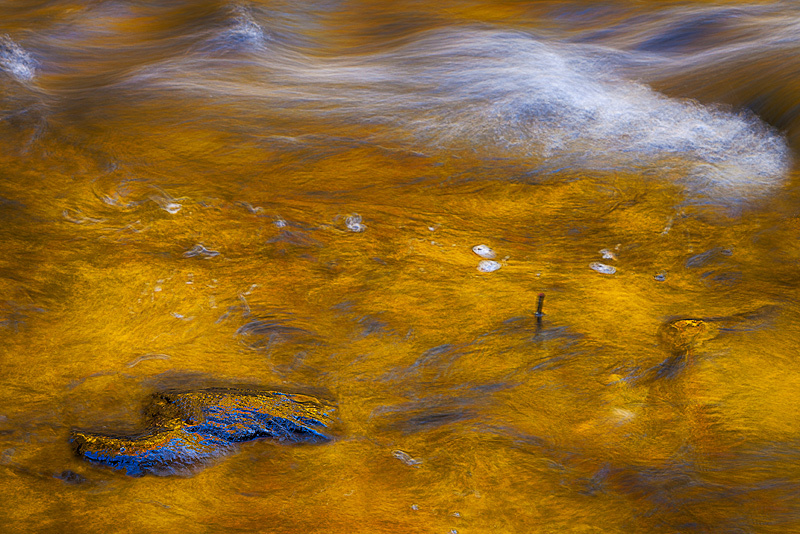 Although dry feet are more comfortable, sometimes the better composition is from inside the creek. Well, that’s it for Part 1. Part 2 will focus on the fun stuff…. composition and the actual shooting. Posted in Tips and Tricks on November 1, 2013 November 1, 2013 by Ken Koskela.